Be the envy of everyone with this stunningly beautiful diamond cluster ring. 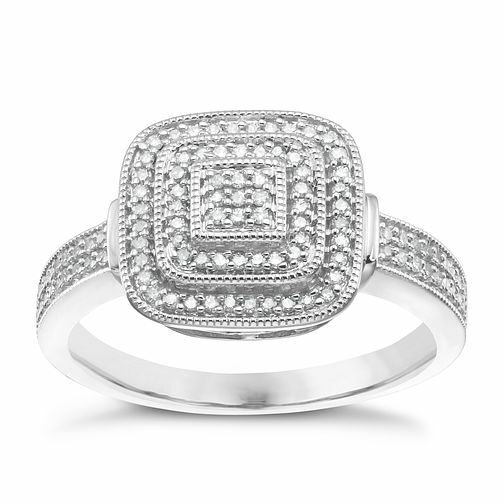 With delicate round cut diamonds set in a double halo cushion design, this 9 carat white gold offers unlimited sparkle that is sure to light up any room. 9ct White Gold 1/5ct Diamond Cluster Halo Ring is rated 5.0 out of 5 by 4. Rated 5 out of 5 by Anonymous from My new engagement ring Absolutely over the moon with this beautiful sparkler... Perfect fit & true to size (I ordered a size K), I ordered this ring after replacing my old ring which was too big & too fragile, this ring however is very sturdy & I feel confident wearing it & not having to worry about it getting damaged, as it's very good quality. Looks beautiful on & sparkles, especially when the light hits it. Very happy indeed . I ordered my ring online & I received it within 2 days after I purchased it. Rated 5 out of 5 by Anonymous from This product remembers me that I am very special priceless person. Amazing, stunning cluster ring with sparkling diamonds like stars. Thank you H. Samuel for the outstanding gift!